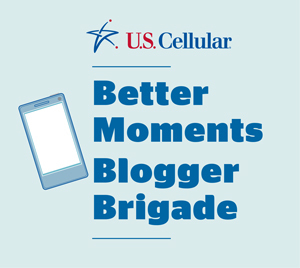 FTC disclosure: I am a U.S. Cellular Better Moments Brigade Blogger and received compenstation for this post. All opinions are my own. I upgraded to the Samsung Galaxy S4 in June. My friends were quite happy that I did because I had complained for about two years about my previous phone. My Samsung Galaxy S4 is a dream. I have used it in six states thus far and have had only great experiences with it. Of course, the phone itself is handy. I text and call my friends often as I have friends spread through the country. I have a friend who is a professional magician and I once texted him a photo of one of his DVDs for sale at a garage sale. (I thought it was funnier than he did!) My friends and I often exchange photos via text because text messages are limited, but a photo is worth a thousand words, and we can often communicate better what made us think of the other person by snapping a photo of it. With my phone I am no longer without a camera. No matter what is happening, and sometimes the most amazing things happen before you know it -- I am never caught without a way to record special moments. I know that when I took my first steps, I wasn't at home, so my mother didn't get to take a photo of me walking to my cousin, but today's parents have the ability to have not just a camera but a video camera with them at all times and can share that moment with family spread over the globe! A phone is handy, but the thing that makes it even better is apps! As soon as I got my phone I started downloading my favorites. Of course Facebook was the first one I installed (and because I was so excited with my new phone my status update was "I'm updating my status using my new Samsung Galaxy S4.") I did have to brag about my new phone, you know! I also love sharing photos on Facebook. I'll see something funny, snap a photo and posting it to my friends -- and it can be anything. I thought a handout at church Saturday night was funny because of a hobby some friends and I have so I snapped a photo of it. I am not a big twitter user on a mobile device, but I downloaded that app next. A very frequently used app of mine is Fooducate. I'd never heard of it until I went to a fitness week. When you are in the grocery store and are looking at two different food products you are considering buying, you can scan the bar code of both and it will give you a grade for each one from A+ to D- (I've never come across anything that is an F grade, but it could exist.) This app will explain why the product received the grade it did from GMOs, artificial sweetners, too much sugar for the amount of nutrition in the item, and if it's a lower grade food, it will suggest products that are similar that are healthier! How handy is that? As someone who didn't learn much about nutrition in school and I'm trying to make healthier changes in my life, this is a fantastic app. I am also a big Foursquare user. This app allows me to check in various places. I've heard people on Facebook say this is the dumbest app and they don't know why anyone would want people to know where they are. The reason I like it is because there are sometimes discounts. I was in Atlanta last year and I got an offer at a local restaurant where I checked that if I connected a credit card to my Foursquare account and used it to purchase $10 or more I would get $5 off. My bill came to just over $10, and so I had lunch for $5 that day. There is also a regional gas station that sometimes offers a free doughnut or candy bar for checking in on Foursquare. My mother loves the doughnuts at that place and it's fun when I'm able to come back out to the car and surprise her with a raspberry cream filled one! Because my mother is on dialysis and I take her three days a week, I'm sometimes having to wait on her. I will often fill those minutes by playing Candy Crush. Another app that makes my life easier is eBay. I sell on eBay and if I'm at a garage sale and see something I can check it on eBay before deciding if I want to buy it or not. Sometimes I find that I should leave the item at the sale, but one time I was at a garage sale and looked up a stuffed animal that I had an idea might be worth something, and there was only one listed, and it was priced at $80! Needless to say, I spent the $3 on the teddy bear! I also sell on Amazon and I can scan anything with a bar code -- be it a book or grocery item to see how it is selling on Amazon. I have even been in a clearance section of a store and found items I could make $40 or more on them just by taking a moment to check what the item is selling for online! In fact, when I upgraded to a smart phone I did so just for this purpose. I figured the additional money I could make would more than pay for my phone. I also love using Google Maps to help me find my way to garage sales! Another app that I use for lots of fun is the Geocaching one. This is the only one I have spent money on. (It costs $9.99 in the Google Play store.) It uses your phone's GPS and the geocaching site to find caches hidden in your area. This is a great family activity. Kids love it since it's basically a treasure hunt gone high tech! Once you have a list of caches in your area, you can select one to find. You can use the map feature if you are a way from it, or you can use the compass feature. A cache can be anything from a tiny container that only contains a piece of paper you can sign or it can be a larger container where you can swap items. I saw one this weekend where kids can swap fast food toys. 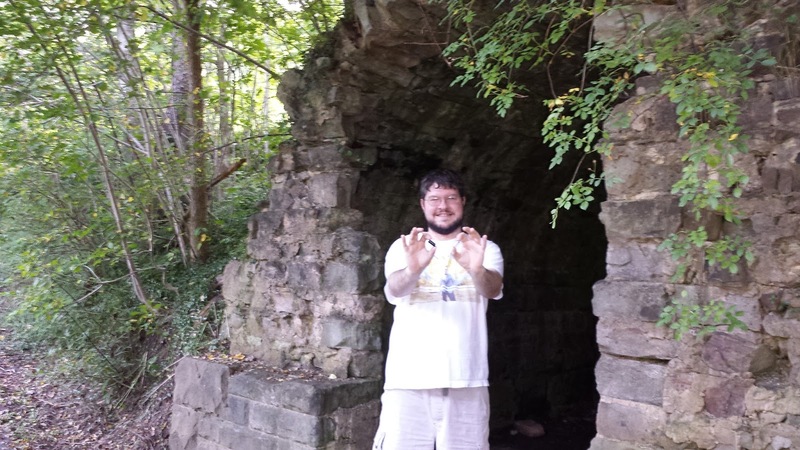 My boyfriend and I found seven caches over the last few days. 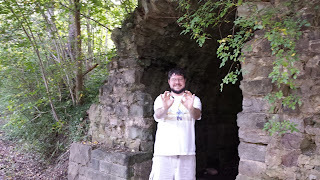 It's an inexpensive hobby and sometimes you run across fascinating places! For instance this cache is a micro one, but believe it or not I had no idea this "gas house" existed even though I have driven by it thousands of times. You can't see it from the road, and even though its only about a three minute walk from the side of the road, I had no idea that over 100 years ago there was a 300 room hotel there! I love the things a Samsung Galaxy S4 can do. It is a phone of course, but so much more. I can use it to help me make money, save me money, connect with family and friends, use it as a GPS, and of course it's also a camera! Click HERE to visit U.S. Cellular and learn more about the Samsung Galaxy S4 phone! Now that I've shared some of my favorite apps, what about your favorite ones? Any you want to share with me?